After 142 years of the United States wearing the coveted crown China is now ranked the world’s largest economy based on purchasing power parity, according to recent GDP data released by the International Monetary Fund. China has emerged as a major global economic power. It is now the world’s largest manufacturer, merchandise exporter, and holder of foreign exchange reserves. The fastest rising of China is democratizing the global economic order. In the mid-18th century, Britain led the world in the industrial revolution. But The US was hot on its heels by huge industrial expansion after its civil war ended in 1865, fuelled by rapid urbanization and huge population growth – including the immigration of nearly 30million Europeans. In 1872, the US economy overtook Britain to become the world’s largest position, but has now lost its status as top dog. The latest IMF figures show the Chinese economy is worth £11trillion compared with £10.8trillion for the US. China – whose wealth has accelerated in recent decades amid rapid industrialization – is expected to extend its lead, with the IMF estimating its economy will be worth £16.7trillion in 2019. That would be 20 per cent bigger than the US economy, which is forecast to be worth £13.8trillion by then. According to IMF, The numbers are based on ‘purchasing power parity’ (PPP) which makes adjustments for the fact that goods are cheaper in countries such as China relative to the US. The simple logic is that prices aren’t the same in each country: A shirt will cost you less in Shanghai than in San Francisco, so it’s not entirely reasonable to compare countries without taking this into account. Without these adjustments for living costs, the Chinese economy is still smaller than that of the US, at £6.4trillion. But experts have described the toppling of America after nearly 150 years by China – even on the PPP measure – as a ‘symbolic’ moment for the global economy. The rapid rise of China as a major economic power within a time span of about three decades is often described by analysts as one of the greatest economic success stories in modern times. From 1979 (when economic reforms began) to 2013, China’s real gross domestic product (GDP) grew at an average annual rate of nearly 10%.1 It is estimated that to date 500 million people in China have been raised out of extreme poverty. Prior to 1979, China, under the leadership of Chairman Mao Zedong, maintained a centrally planned, or command, economy. A large share of the country’s economic output was directed and controlled by the state, which set production goals, controlled prices, and allocated resources throughout most of the economy. During the 1950s, all of China’s individual household farms were collectivized into large communes. To support rapid industrialization, the central government undertook large-scale investments in physical and human capital during the 1960s and 1970s. As a result, by 1978 nearly three-fourths of industrial production was produced by centrally controlled, state-owned enterprises (SOEs), according to centrally planned output targets. Private enterprises and foreign-invested firms were generally barred. A central goal of the Chinese government was to make China’s economy relatively self-sufficient. Foreign trade was generally limited to obtaining only those goods that could not be made or obtained in China. China’s rise began after the ruling Communist Party completed its sixth five-year plan, a document the party still uses to help guide the economy, inaugurating a new era of economic reform and opening to foreign trade. China was the world’s leading trading nation up to the 18th century, until control of its ports and trade were taken over by imperial nations in Europe. Under Communism it remained inward-looking, until 1980 when the government started to allow foreign investment. Since the Chinese economy opened up to allow private enterprise in 1978, businesses and companies have sprung up and found considerable success amidst the fierce competition that exists in many strata of society. Private businesses have to compete constantly to fight for market share, both internationally and domestically, with little concern about government intervention. The central government initiated price and ownership incentives for farmers, which enabled them to sell a portion of their crops on the free market. In addition, the government established four special economic zones along the coast for the purpose of attracting foreign investment, boosting exports, and importing high technology products into China. Additional reforms, which followed in stages, sought to decentralize economic policymaking in several sectors, especially trade. Economic control of various enterprises was given to provincial and local governments, which were generally allowed to operate and compete on free market principles, rather than under the direction and guidance of state planning. In addition, citizens were encouraged to start their own businesses. The Communist Party of China (CPC) carefully directs the country’s growth. Buttressed by government subsidies, state-owned enterprises (SOEs) maintain a dominating presence in the domestic market — largely in the banking, transportation, telecommunication and energy sectors — and often prevent competition. In the late 1980s and 1990s, involved the privatization and contracting out of much state-owned industry and the lifting of price controls, protectionist policies, and regulations, although state monopolies in sectors such as banking and petroleum remained. The private sector grew remarkably, accounting for as much as 70 percent of China gross domestic product by 2005. From 1978 until 2013, unprecedented growth occurred, with the economy increasing by 9.5% a year. China’s economy surpassed that of Japan in 2010 as Asia’s largest economy. The country now accounts for 15.4 percent of global GDP and 28 percent of annual growth in global GDP, and its international trade and investment ties are deep. Reform lifted at least 330 million people out of poverty over the past 35 years. 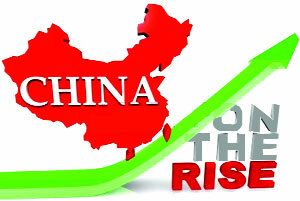 The emergence of China as a major economic power has raised concern among many US policy makers. Some claim that China uses unfair trade practices (such as an undervalued currency and subsidies given to domestic producers) to flood U.S. markets with low-cost goods, and that such practices threaten American jobs, wages, and living standards. Others contend that China’s growing use of industrial policies to promote and protect certain domestic Chinese industries or firms favored by the government, and its failure to take effective action against widespread infringement of U.S. intellectual property rights (IPR) in China, threaten to undermine the competitiveness of U.S. IP-intensive industries. On the other hand, China sees natural common ground with emerging economies, especially in the pursuit of a new international economic order and the democratization of international relations. In Beijing’s view, the 2008 financial crisis dramatically changed the mapping of the world economy, deeply damaging the strength of the traditional developed countries. The economic recovery of the U.S. and Japan has been sluggish, while the euro zone crisis has lingered on for years. The relatively impressive momentum for growth comes from emerging economies, especially the BRICS nations. Since the BRICS countries’ share and importance in the world economy has been growing but has not yet surpassed the developed countries’, the next step, naturally, would be for them to act as one group to increase their collective voice and bargaining power against traditional developed countries. As the President of China, Xi Jinping says, the international economic governance system must reflect the profound changes of the global economic reality, and emerging markets economy developing countries deserve more representation and bigger voices. The reform of voting rights at the IMF and World Bank signifies the direction to which China aspires—in Beijing’s dictionary; more responsibility is only justified when it is accompanied with more rights. The creation of BRICS Bank will help to do so more easily. The aspect of democratizing the global economic order will be eliminating the dollar’s global hegemony. In recent years, China has been involved in a multitude of efforts to promote the Yuan as an international currency. Recently, China signed currency swap agreements with both Australia and Brazil, and one it signed earlier with Pakistan went into effect. However, China will have to face many economic challenges. The ability of China to maintain a rapidly growing economy in the long run will depend largely on the ability of the Chinese government to implement comprehensive economic reforms that more quickly hasten China’s transition to a free market economy; rebalance the Chinese economy by making consumer demand, rather than exporting and fixed investment, the main engine of economic growth; boost productivity and innovation; address growing income disparities; and enhance environmental protection. China’s authoritarian development model appears robust, generating high real growth year after year. But if true economic development is measured by the alternatives open to people, China’s market socialism falls far short of achieving the status of Hong Kong as the world’s freest economy. The lack of freedom to openly criticize the Chinese Communist Party’s monopoly on power, people won’t be free to choose preferred alternatives, including a genuine rule of law that protects life, liberty, and property. Finally, for the new world order, China must have to become actively involved in the global economy that will be benefitted for the people worldwide, so that the country can get the global support.